Yimiton's Blog: Saka taunts 'yellow' and declares Etisalat 'Best Network' in a brand new poster. 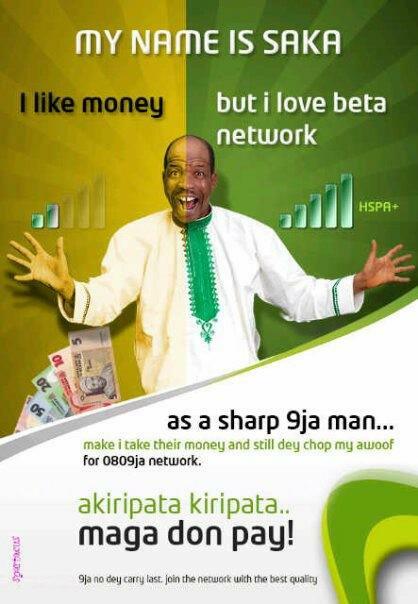 Saka taunts 'yellow' and declares Etisalat 'Best Network' in a brand new poster. I couldn't help but laugh when I saw this poster this morning. Saka seems to be torn between 2 networks but obviously declaring for the better one. I can't say if this poster is genuine or not. Somebody sent it to me and I thought I should share with my readers. Pray tell, what do you think of this phenomenon called Saka? His face alone makes me laugh, hahaha.